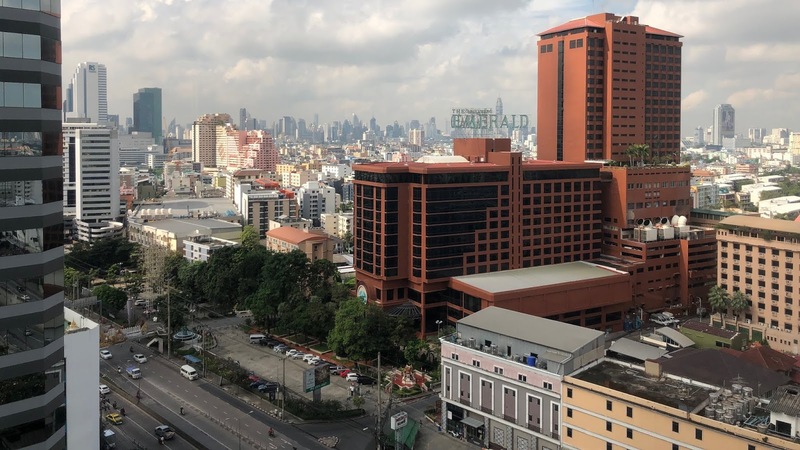 We arrived at Bangkok Suvarnabhumi (‘Land of Gold’) airport to the East of Bangkok and met the coaches that would take us to the Swissôtel Le Concorde in Bangkok’s Huai Khwang district. The scenes from the coach window were very different to Brunei’s. Even though it was 22:00 the volume of traffic was immense. We proceeded towards our destination on the wide but densely packed roads. We were surrounded by scores of other vehicles that were calmly weaving, although almost bumper-to-bumper. 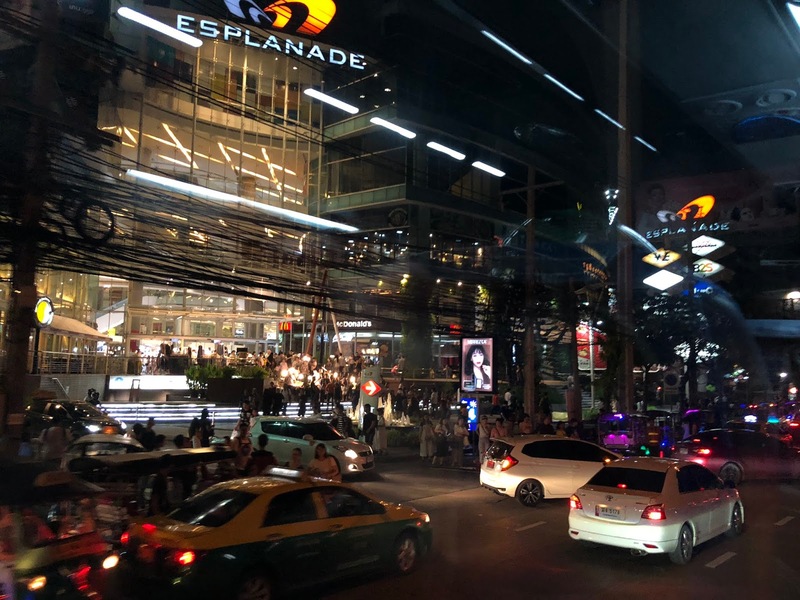 Drivers would change lanes at a moment’s notice, the kind of behaviour that would insight anger and beeping in many other cities - but not here in Bangkok. To the initial viewer the traffic seemed erratic and risky but it was actually more calm and calculated than it first appeared. There was a sense that nobody had much of a claim to a right of way which meant that road users proceeded with a certain amount of caution, perhaps expecting the worst - and somehow it worked itself out. Proceeding so gradually, there was plenty of opportunity to look around and take in the street scenes on each block. We were travelling from the airport on the east of the city to a hotel in a suburb still quite a way east of the centre. Even these suburb districts were very busy. The inner city has 8 million inhabitants (12.6% of Thailand) and it seemed like all of them were all out and about. There were bright lights everywhere. People were eating and drinking and sitting on plastic stools in every available space of the pavement beneath incomprehensibly-tangled electricity cables on telegraph poles. Charcoal smoke billowed from street food kiosks, vendors turned skewered meat on sizzling hotplates, durian fruit was chopped and wrapped hurriedly in thick clingfilm (if you know what durian is, you’ll know why it’s wrapped in clingfilm without delay), crowds prayed in an illuminated halo of incense at colourful street corner temples with rows of neatly-paired shoes outside, and shops (open out onto the street) revealed the ever-present sight of people working together. If it was this busy out here, I wondered what the centre of Bangkok would be like. To a recent arrival like me it seemed bustling and fascinating. The coach arrived at an impressive 22-story tower, the Swissôtel Le Concorde - our home for the next five days. 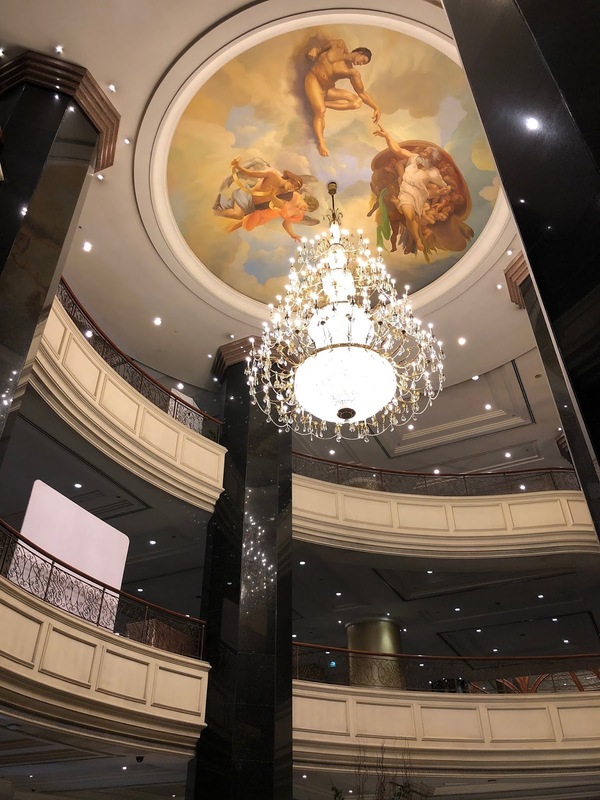 Upon entering the lobby the impressive octagonal columns led the eye past three mezzanine levels, beyond a three-tiered chandelier and further upwards towards a painted ceiling - a reproduction of part of Michaelangelo’s famous work in the Sistine Chapel. I checked into room 1512, on the fifteenth floor, to a stunning view over the distant city skyline. There was clearly a lot more of this city to see. For now, we were hungry and I was eager to start exploring the local area. We had seen an inviting-looking place on the street corner opposite the hotel; it was packed, it seemed very popular and it looked like it had a good atmosphere. We thought it would be a good place to start with a drink - the idea of being able to purchase beer just anywhere was particularly alluring after being in a dry country for four days. On closer inspection it transpired that our ‘bar’ of choice was actually a temple - the ‘bar’ must have been a mirage - but even still it was worth crossing the road for. Crossing the first road was an experience. Although traffic lights were obeyed, the lights changed quickly and drivers drove with real purpose. Traffic seemed to come from all around and crossing a road was a somewhat nerve-wracking experience. Eventually we all became more accustomed to this daily peril; it gradually seemed to get a lot easier and feel a lot safer. Still, there were occasions at big interchanges where it felt like it would be a good idea to get a taxi or tuk-tuk to the other side and let an experienced Bangkok driver look after you! 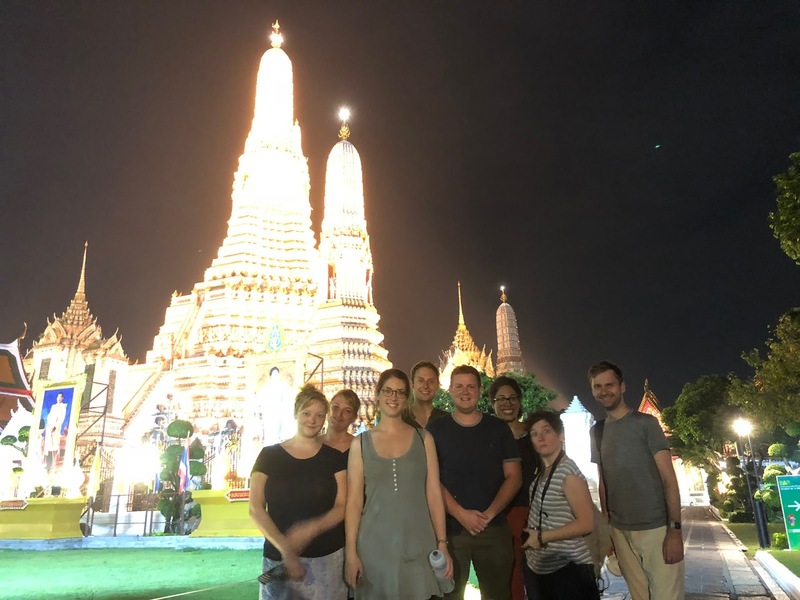 After the initial confusion between temple and bar we went on to find a night market in Huai Khwang, which was gradually discovered by more of our colleagues. We ate informally and enjoyed Thai seafood, curries and noodles at long tables with bottles of cold beer. It was still sweltering at this late hour and a bottle of cold beer really hit the spot. After this late dinner many of the large group decided to retire to the hotel. 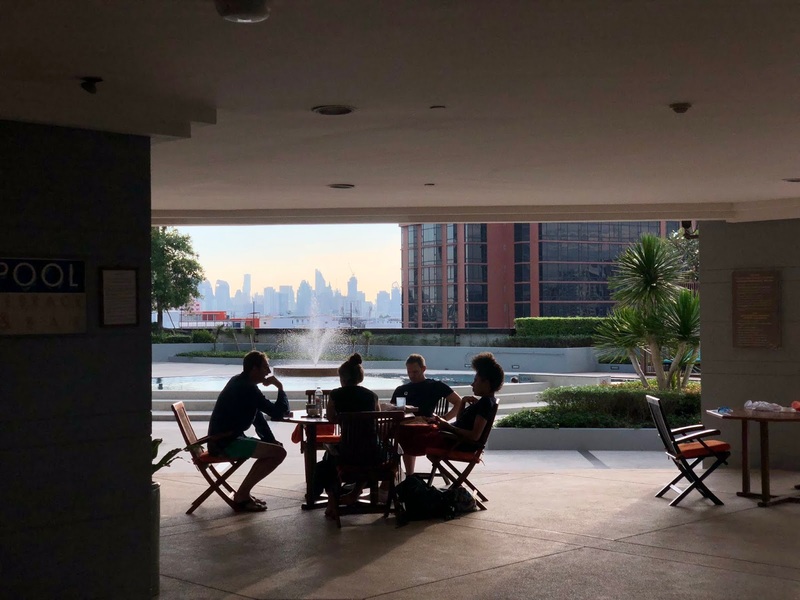 I wasn’t quite ready to go to bed; I was so happy to be in Bangkok - I already loved it. Four of us stayed out to have another drink in a roadside bar, sitting outside and soaking up the atmosphere. The tour now felt in full swing and I felt as if a part of me had just come to life. We had from Monday 22nd October 2018 until Wednesday 24th October 2018 as free days before a performance at the Thailand Cultural Centre on Thursday 25th October 2018. Several in our group would be busy with educational projects for the Start Your Impossible initiative, others would be meeting various ambassadors, attending embassies, going to press events, meeting sponsors, giving video interviews, understanding royal protocol and so on - and the rest of us had ample time to explore Bangkok. On Monday morning, after a leisurely breakfast, Will Russell (second trumpet) and I departed the hotel to the by now expected blast of heat and humidity outside. We walked along the road trying to find the nearest underground railway station - unfortunately to no avail. We walked around and noticed the small shrines outside every building, each individually decorated and adorned with colourful flowers. 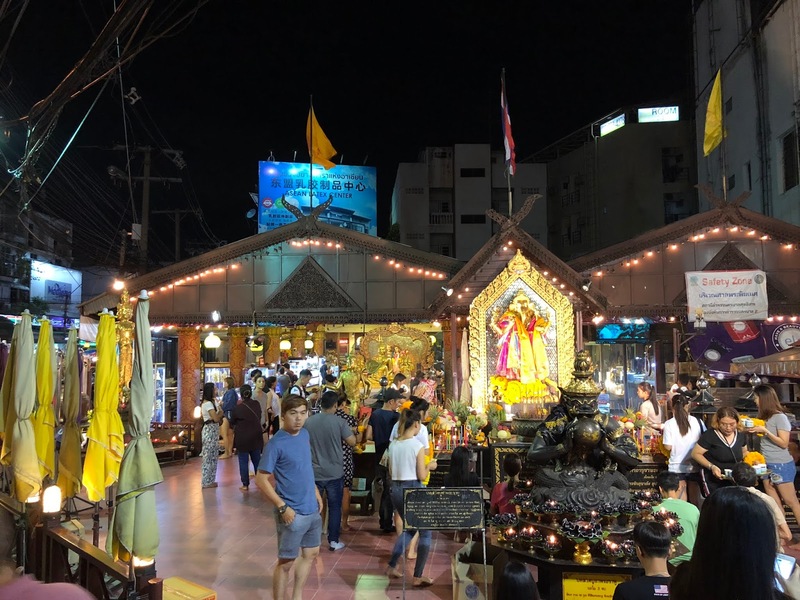 After about 20 minutes, passing plenty of these shrines, we realised that we were still no closer to finding a station so we decided to take a taxi into the centre of Bangkok. We thought that we could come back on the train later to learn where the station was for next time. Fortunately taxis were generally inexpensive here and the air conditioning inside was more than welcome. Even the taxi (incidentally, a Toyota of course) had its own shrine on the dashboard, of florescent yellows and oranges. The taxi’s interior roof was decorated with a psychedelic floral print in blue tones and it was adorned with a portrait of the Thai King just above the rear view mirror. I had read the etiquette protocol about Thailand in our information pack and I recalled that the King and all the members of the Royal Family are deeply revered by the Thai people. We passed portraits of the King on special roadside billboards and his photograph could be seen in many public places, in fact in most places. The currency (Thai Baht, THB) features an image of the King and must also be treated respectfully. The taxi driver was a very polite young man, wearing an impressively-pressed pale blue shirt, smart chinos and aviator sunglasses. We paid our fare outside the Royal Palace and I carefully handed the money to him, placing my hands together while making a small bow of my head. The driver gave a deeply reverential bow toward the note, spanning further than I thought possible while seat-belted in the drivers seat. I was impressed. We were dropped off on the roadside opposite the Royal Palace. We were almost immediately intercepted, while attempting to cross the road, by an old gentleman in a yellow polo shirt. 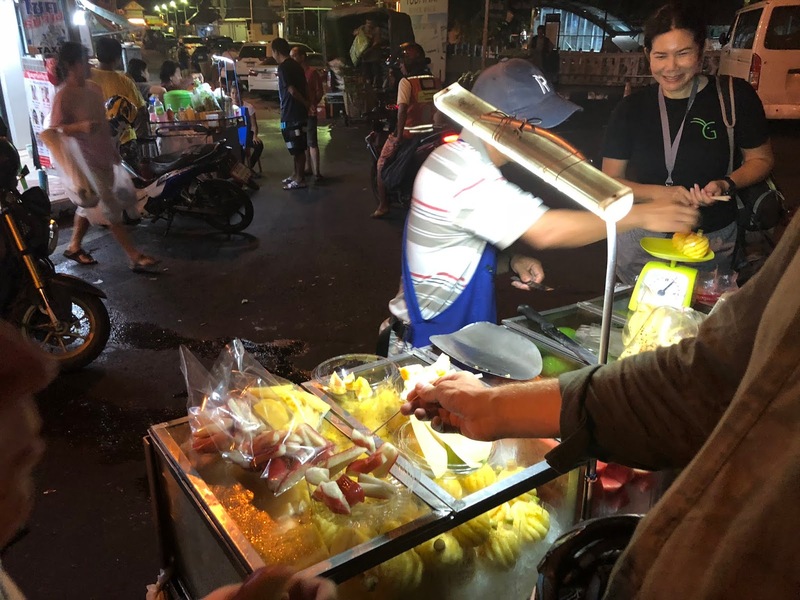 The man spoke to us in English - at considerable speed - with a thick Thai accent, and he mistakenly said a few contradictory statements confusing crucial words like open/closed and long/short. He was offering us tourist advice. I was initially quite sceptical of him because he had approached us, rather than vice versa, but I warmed to him. His manner, though decisive, was not a hard sell. He pointed out that he worked for the Thai Government as a tourist advisor and his name was Mr. Chai. He was very thin, his arms filled little of his polo shirt sleeves, he was very old, and he was sun-tanned from working outside, presumably most days. He informed us that the Royal Palace was closed to visitors today in preparation for the national holiday [of King Chulalongkorn Day, 23rd October]. He advised when we should to return to the Royal Palace and, pointing at our legs, made a reference to wearing ‘short-long pants’ - I assume he meant to wear trousers. Without hesitation, he segued into planning our day for us, in lieu of being able to go into the Royal Palace, and he produced a map which he annotated with encircled numbers. He said ‘number 1, temple, Buddha, short-long pants OK’ and so on. As he described each place I was thinking that this route would be impossible in just a day, especially in this heat. Mr. Chai asked us if we wanted to follow his route - we looked at each other approvingly - and so he flagged down a passing tuk-tuk, one with a certain colour (yellow, I think) license plate (as opposed to pink). Taxis and tuk-tuks are colour coded by category in Bangkok. Unfortunately the driver had stopped in a restricted area (stopping was not allowed outside the Royal Palace) and the driver was immediately fined by a police officer on a motorcycle. That didn’t bode well, I thought. [To be honest I wasn’t really sure what was happening at this point and so I just went with the flow - trusting Will’s judgment and Mr. Chai’s honesty]. Anyway, Mr. Chai showed the driver his map, negotiated a price for us and explained that the tuk-tuk driver would take us to all the annotated locations on the map, that he would wait for us at each venue and then take us on to the next one when we were ready and then we’d pay him ฿200 THB (Thai Baht), around £4.80 GBP at the end of it all. 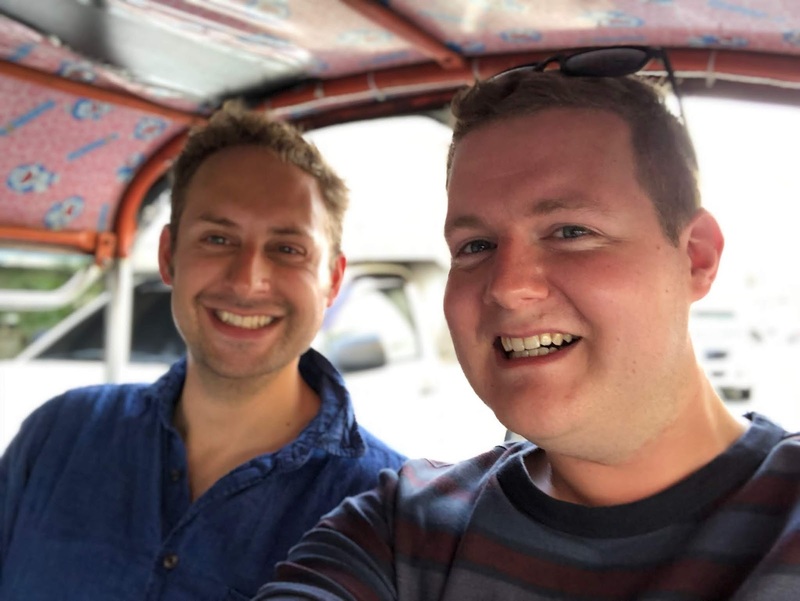 We climbed into the back of the highly-modified, boy-racer’s tuk-tuk and thanked Mr. Chai. 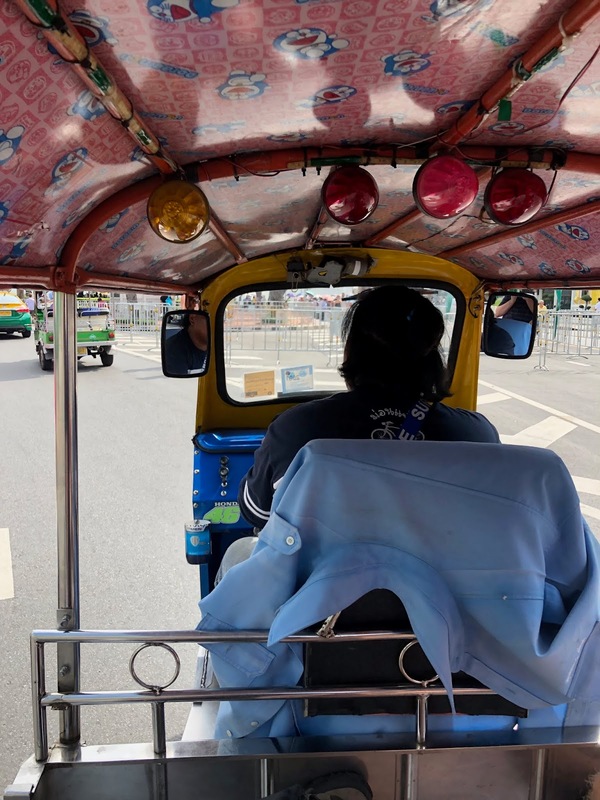 We departed, waving and grinning from ear to ear as we set off around some of Bangkok’s busiest roundabouts amid hundreds of other motor vehicles, mostly other tuk-tuks. Thank you Mr. Chai! There’s something about being on a tuk-tuk that means you can’t help but smile. Perhaps it was the weight distribution, its nimble handling on the road, the noise, the smell and proximity of the slightly ailing two-stroke engine, or the blurred road passing below at great speed. Whatever it was, it certainly is fun and it was definitely the quickest way to get around. The moving air cooled us down as we darted through traffic on main roads. Occasionally we would lurch, almost skidding, into a 90 degree turn to trundle down a backstreet. 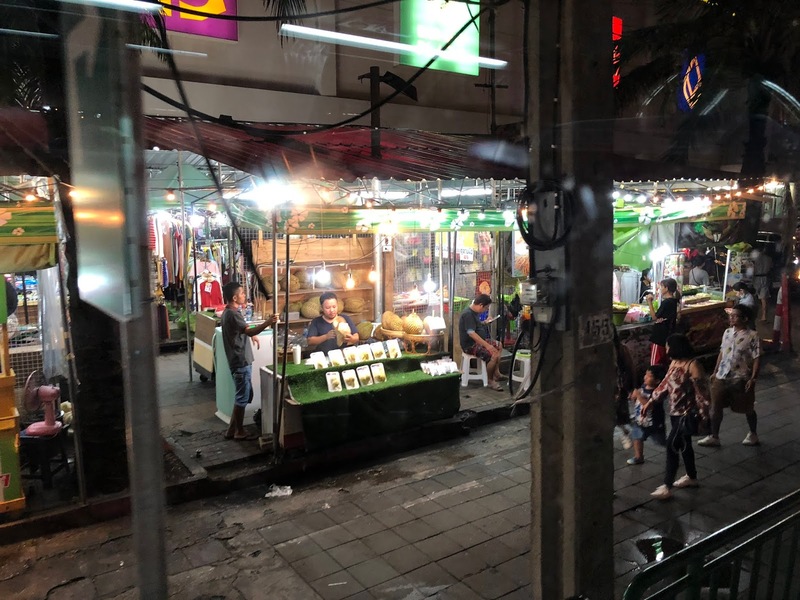 It was in these backstreets where we could see a fascinating and unmanicured view of Bangkok life. Mr. Chai’s first halt was Wat Saket, a stunning Buddhist temple in the Pom Prap Sattru Phai district. Cloisters surrounded the ornate central temple of red, white and gold. There were distinctive shapes with symbolic carpentry on overlapping and steeply-pitched gable ends. The whole place was devoid of other tourists when we arrived. 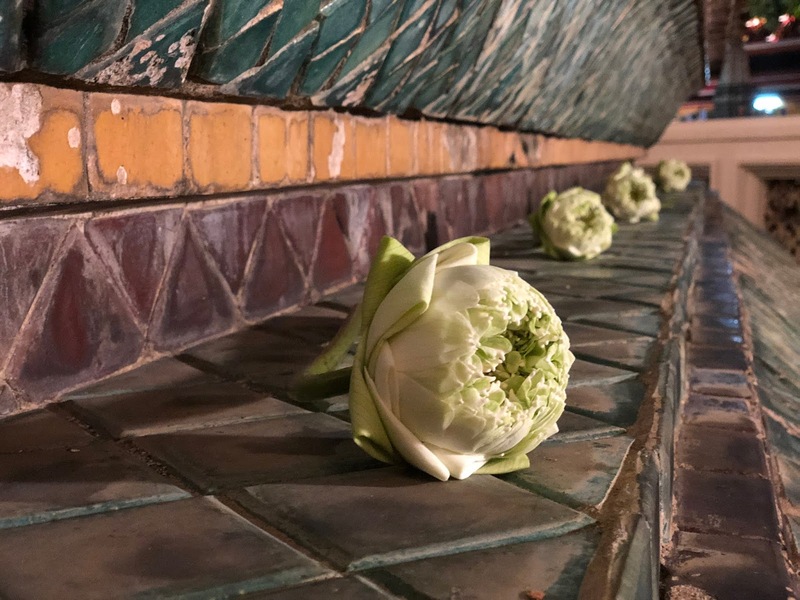 Taking our shoes off at the door, we entered this tranquil temple, standing on plush red carpet and looking towards a tiered shrine with flowers of white and yellow behind which was a golden Buddha, sitting cross-legged. Colourful tapestries hung on the walls and the tall windows, surrounded by black and gold shutters, let in plenty of light. We would see many more temples on our tour but none were as tranquil and deserted as this. We enjoyed the serenity. As we were putting our shoes back on, of all the 8 million people in Bangkok, we bumped into the four horn players from our tour. We went back to the tuk-tuk - the driver was having a snooze in the back. He jumped to his feet, we jumped on board and motored to our next location. 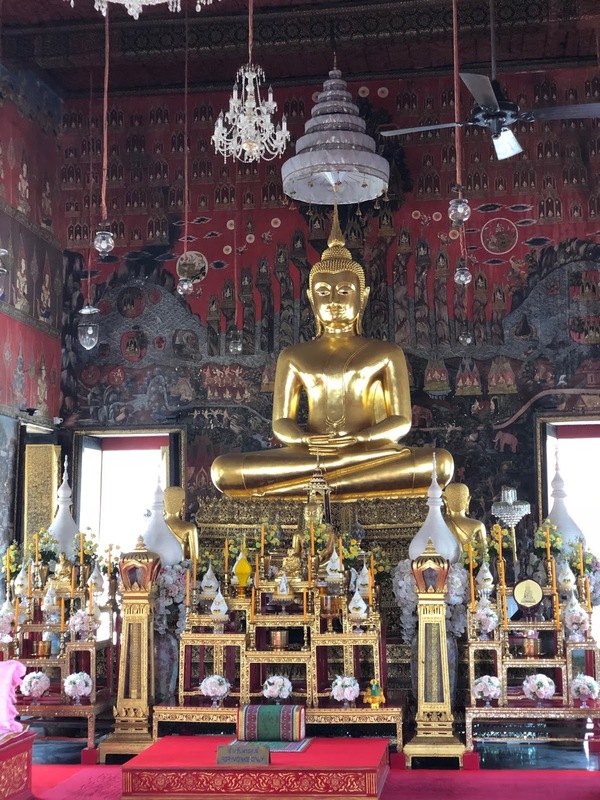 Wat Intharawihan in the nearby Phra Nakhon district was next on Mr. Chai’s route. This venue had a standing Buddha, 32 metres tall. It was unfortunately completely shrouded in scaffolding, but nevertheless we had a brief look around. It was quite different to Wat Saket; it was much less tranquil - not as private from its surroundings. I was glad to see a small shop where I could exchange (while remembering to respectfully handle) ฿40 Thai Baht for large, ice-cold bottles of water before returning to our tuk-tuk. While annotating the map, Mr. Chai had asked us (in that slightly bewildering conversation) whether we were in Bangkok for work or pleasure. Being strictly technical, we answered saying that we were there for work - we were. With hindsight it would have made things conversationally a lot simpler if we had just said for pleasure, as tourism was our main goal on that particular day. We were unable to say otherwise so Mr. Chai had included a visit to a tailor for the third stop of our route. We weren’t particularly interested in buying anything but the tuk-tuk driver stopped outside a shop and invited us to go in. We entered this backstreet tailor’s. We were warmly welcomed and immediately offered drinks (we politely declined), a place to seat, several catalogues - the works. We did not really want any of that and we had only entered at our tuk-tuk driver’s encouraging gesture. I thought we might have seen a busy shop with displays or exhibitions or something for tourists but it was just a tailor’s shop, with rolls of fabric leaning against walls et cetera. It was quite formal, so we looked through a few catalogues and feigned interest, mostly out of politeness. In fact, out of sheer curiosity we looked at the option of having tailored tail coats and concert trousers made. We were shown various different grades of black fabric and any number of possible linings, some plain and others that really made a statement. It was actually quite tempting to have a set made. They would have been about ฿8000 THB, the equivalent of about £195 GBP, but I didn’t really want to cart them around with me for the next four weeks of the tour. We politely made our excuses and made to leave without purchasing anything. The shopkeeper’s initially glossy, polite attitude toward customer service noticeably dropped down a rung as we left. 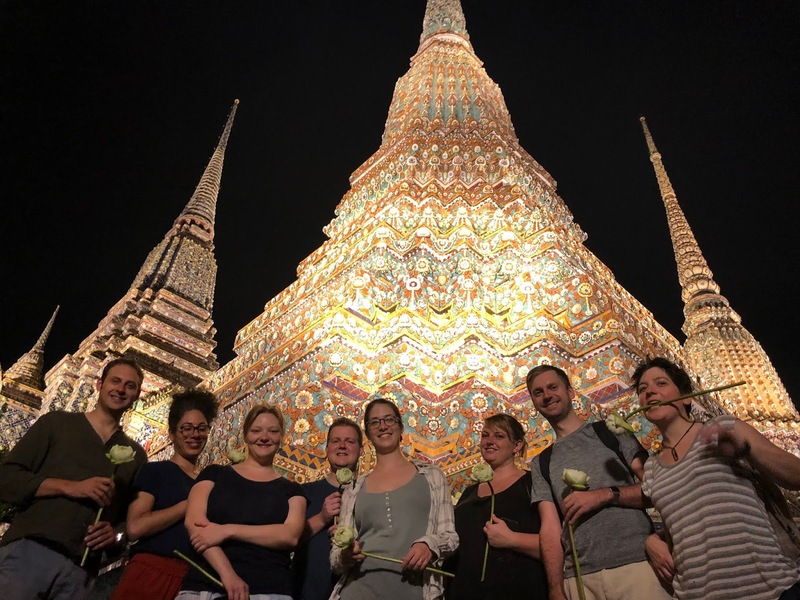 We returned to the tuk-tuk in record time and made for our fourth and final destination - a road that led to the riverside, near to Wat Pho and not far from the Grand Palace. We paid the tuk-tuk driver and met a man with a clipboard who we paid for a boat tour. Mr. Chai had told us to ask for the non-tourist tour (or at least price). We had not changed much money into Thai Baht and we were running short. I had some US dollar bills in my wallet, so I paid for the boat tour in multiple currencies. A few minutes later we were in a traditional wooden boat (a Long Tail boat). It featured a sharply rising bow and rows of passenger seats. A driver stood aft operating a huge V8 engine mounted at the stern with a long propellor shaft disappearing into the water far behind the vessel. 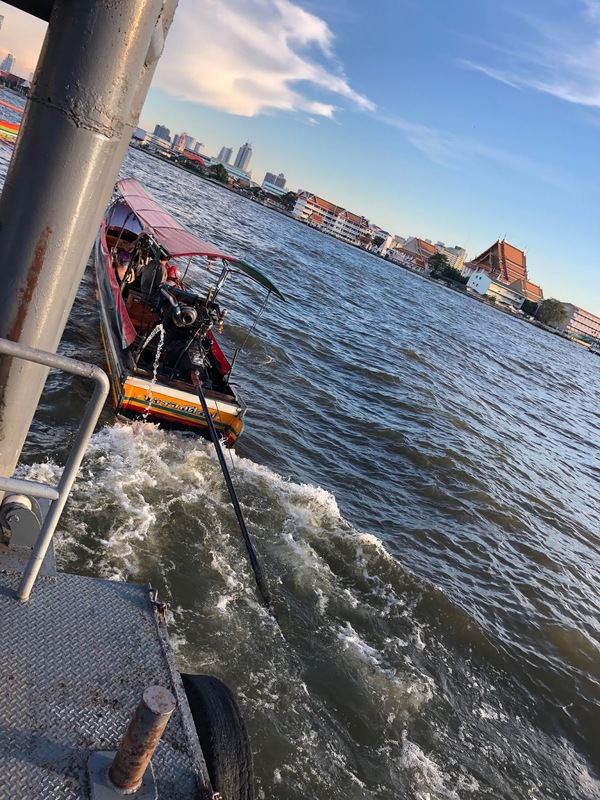 We boarded and the boat immediately departed across the Chao Phraya River. These boats were powerful. 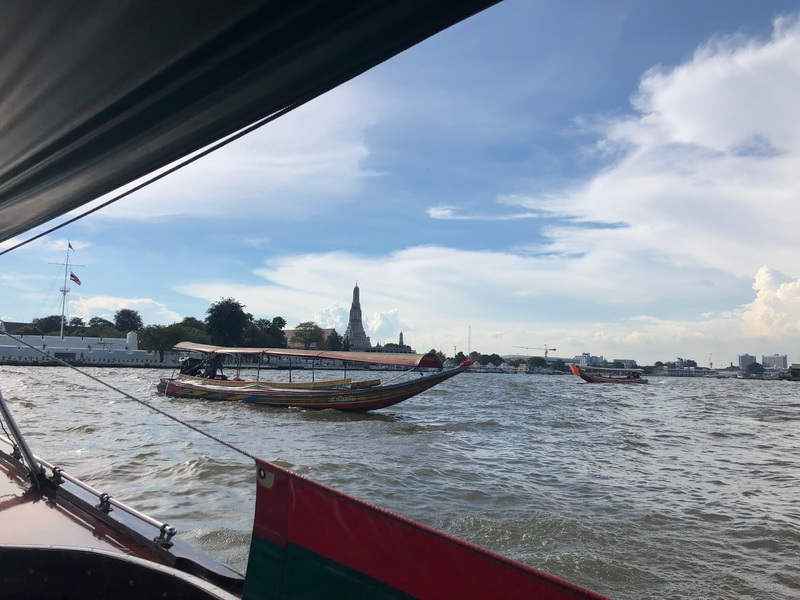 We sped across the river taking in the sights of temples (past the recognisable Wat Arun or ‘Temple of Dawn’), palaces and other buildings on each side of the packed riverside. The driver boldly negotiated river traffic and the bow of the boat rode out of the water before crashing back down, splashing many of the passengers as it fell. It was invigorating and cooling, but I took care to keep my mouth closed and to keep my camera dry. The driver manoeuvred the boat into a canal on the other side of the river and we waited there in a queue, for at least half an hour, while the canal lock filled and drained with about twenty vessels at at time passing through. 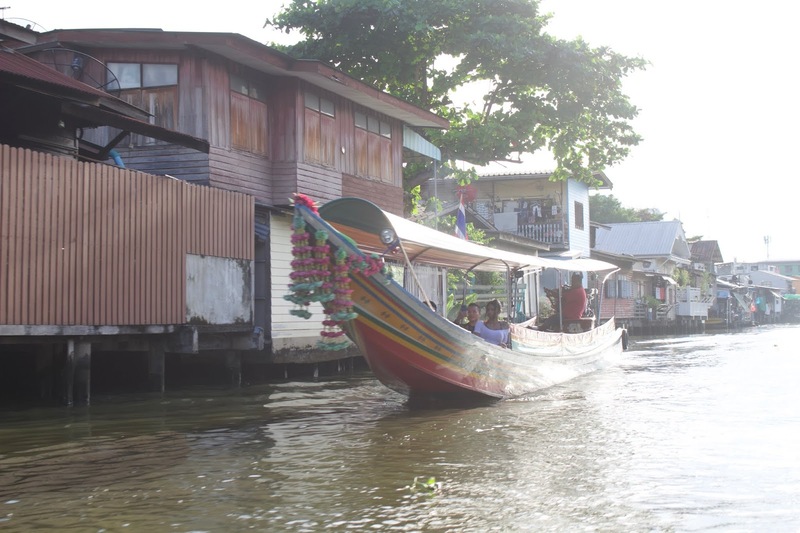 We went around a system of 6km of canals, Khlong Bangkok Yai being the main one, and saw many wats, mosques and palaces. Many of the homes alongside the canal were suspended on poles above the waterway; some were meticulously cared for and others were in severe disrepair. People rode motorbikes, hung out laundry, cast out fishing lines and prepared meals. Families waved to us from alongside the canal. It was relaxing and interesting, and unfortunately also a very good way to get bitten by insects. I got about 30 bites on my legs, despite them being covered in citronella. We made another high-octane splashy dash across the river and disembarked at the Riva Arun jetty at the end of Maha Rat Road. We went on to explore more of the east bank, down towards the flower market, and we walked to the railway station, taking the metro back to the hotel. We went out much later that day, in the Huai Khwang district again - near the hotel. 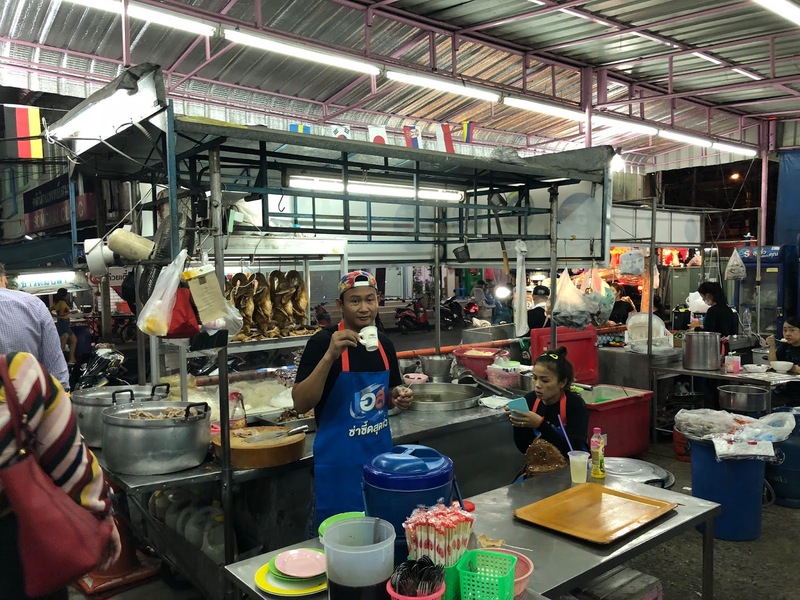 This time we found an authentic night market called simply: Huay Kwang Street Food [Pracha Songkhro 36, Khwaeng Din Daeng, Din Daeng, Krung Thep Maha Nakhon 10400, Thailand]. The menu was straightforward, with a choice of four items for a starter and four items for a main course. I had spring rolls and a delicious bowl of noodle soup. We sat outside by an old fountain in this square and watched a happy little boy who was helping his parents at work by delivering ice-filled cups to the tables. 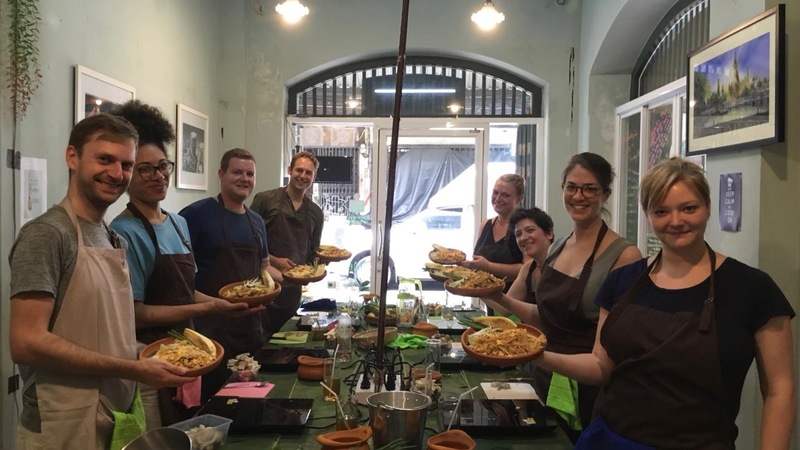 The next day eight of us (Alice, Carina, Ellen, Jacek, Hayley, Kinga, myself and Will) had elected to go on a Thai cooking course. We would meet a chef at his premises on Tha Tian Alley and begin from there, but we had arrived sooner than expected and we had half an hour before our appointment began. 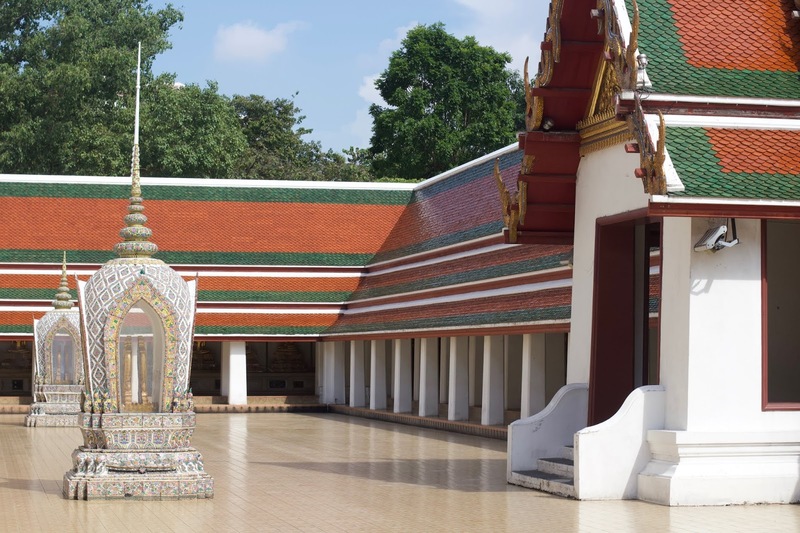 Tha Tian Alley is just opposite Wat Pho and most of us had not visited it yet, so we took the opportunity to visit the ‘Temple of the Reclining Buddha’. Wat Pho (or ‘Wat Phra Chetuphon Vimolmangklararm Rajwaramahaviharn’ to copy and paste its full name) is one of only six temples in Thailand to be classed in the highest grade of the First Class Royal Temples, and the school of Thai medicine on the site is understood to be the birthplace of Thai massage which is still practised and taught at the temple. This walled complex is huge and very impressive. 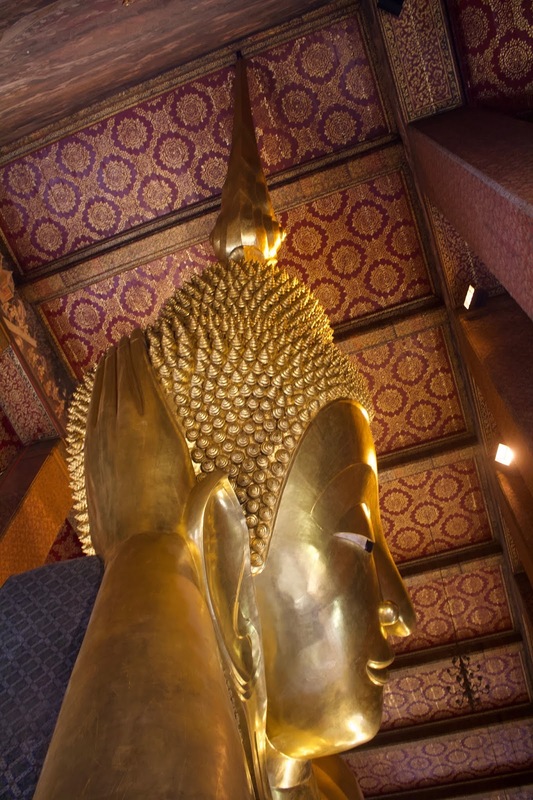 The Reclining Buddha inside the chapel is 15 metres high and 46 metres long (that’s about two double-decker London busses high by five wide) and the soles of the Buddha’s feet are intricately inlaid with mother-of-pearl. We viewed this impressive Buddha and heard the sounds of visitors dropping small coins in the 108 bronze bowls along the wall behind the Buddha. 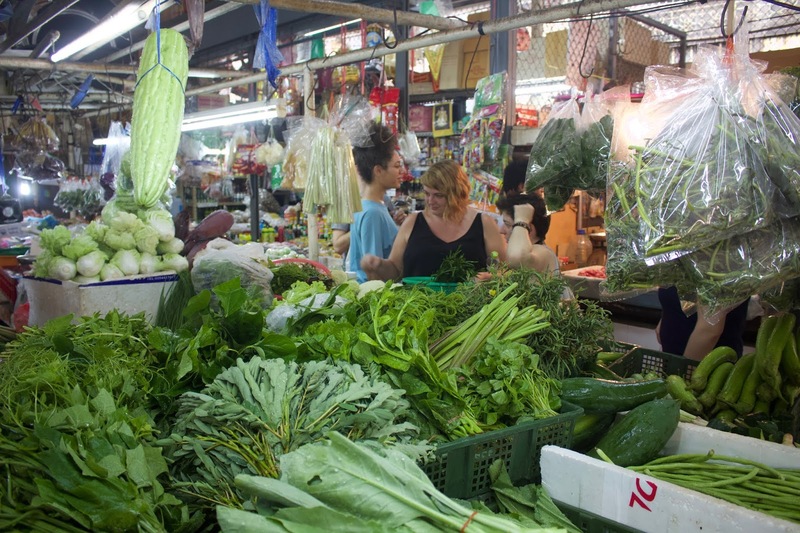 We left Wat Pho and crossed the road (we were getting better at crossing roads now) to attend the cookery course. Some shopkeepers had so much on offer they could barely see from behind the counter. Great piles of herbs, mushrooms, colourful stacks of limes, with bags of this and bunches of that everywhere. One stall sold only tofu and beansprouts. Another, only beef. The seafood stall impressed us, with both familiar and unfamiliar specimens laid on the ice. Elsewhere, great mountains of turmeric root stood stacked in tall baskets, and an exhausted cat had curled up inside a smaller spare basket. Outside men were standing on top of highly-stacked trucks, throwing bags of produce down to their colleagues at road level. There were so many fascinating stalls around but the best smell was at Nittaya, 110 Soi Tha Klang. Ten brightly coloured cooking pastes were piled in blue and white porcelain bowls and covered with hemispherical plastic lids. The piled-up bowls were placed in two rows on the counter and the shopkeepers were busy making more pastes in large vessels further inside the shop. This establishment had clearly stood the test of time - established in 1964, if I understood correctly. 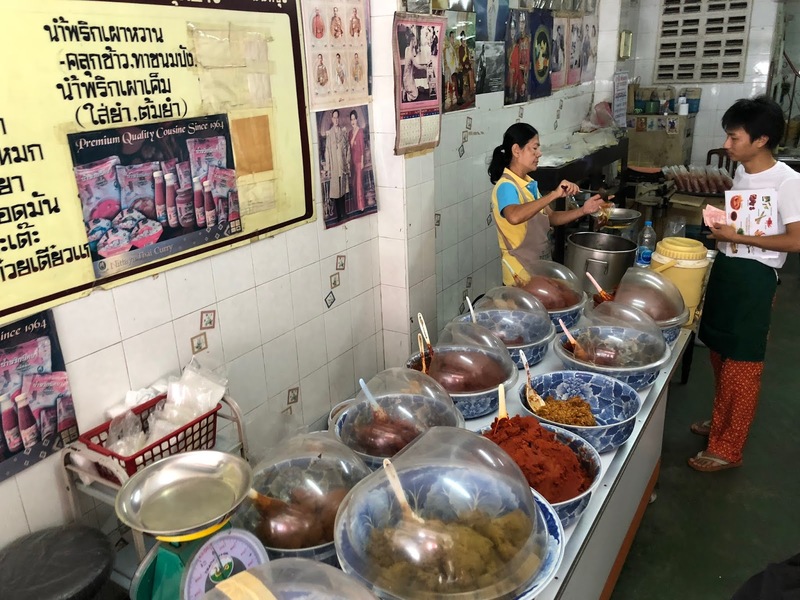 There were at least twice as many posters of the Thai Royal Family on the wall than there were Thai pastes on offer, which was quite charming. The smells were pungent, astringent and concentrated. We departed with a large bag of Massaman curry paste. Before we left for the market, Chef Andy had put on a huge pot of water to boil and he poured in at least 1.5kg of sugar as we watched in amazement. While we were in the market, he had surreptitiously bought a bag of dried bael fruit. When we got back to the kitchen his assistant had covered the large table in banana leaves and laid out eight places with chopping boards, simple paring knives and an electric induction hob each. Andy showed us the dried bael fruit he had bought and he dropped the naturally perforated slices into the sugary water to make a drink similar to lemonade, but with bael fruit instead of lemons. It was a bit too sweet for me, but it was interesting to try it. We followed Andy’s instructions and made the three dishes over two or three more hours. We ate some of them for lunch and took the rest home in containers. It was outrageously good food - all the better for having been around the market - and it had been quite an experience. On the cab ride back to the hotel, we went down a street lined with hundreds of Buddhas. Behind the shop fronts, thousands more golden Buddhas were lined up in stock. 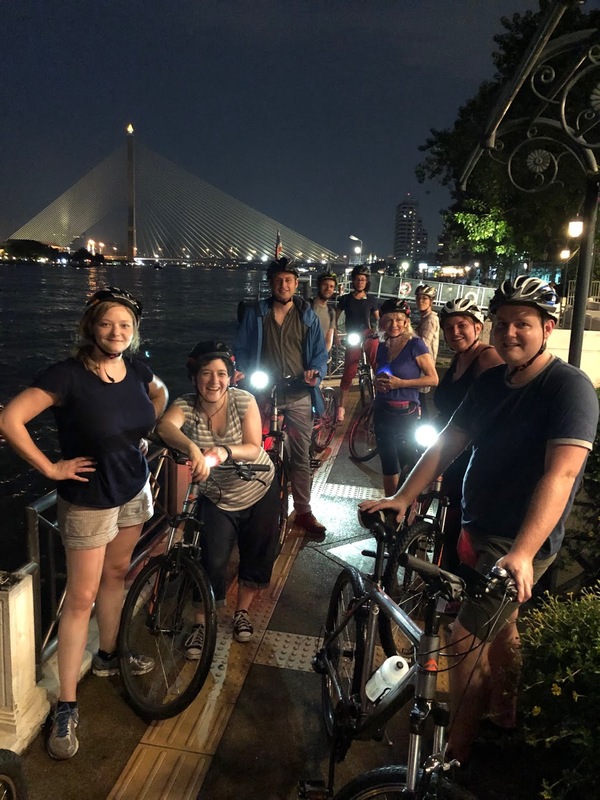 That evening, after a monumental downpour, the same eight of us that had been on the cookery course embarked on a cycling tour of Bangkok; clearly we were feeling more comfortable with the traffic situation. The cycling tour with Grasshopper Adventures was really well organised. We had sent a list of our measurements and the organisers had pre-selected suitable bicycles and adjusted the height of the seats to suit us all. Helmets, lights and a free reusable water bottle (to keep) were also provided. For ฿1450 THB (about £35 GBP) we had an exceptional excursion off the beaten track on both sides of the river in Bangkok. The route was brilliant - I logged it on a cycling app. Going in the evening was much cooler and quieter than it would have been by day and our guide was indispensable. The tour took us through back streets towards the river and down the east bank towards the Tha Prachan ferry terminal. We boarded with the bikes and crossed to the Prannok Pier on the other side of the river, while enjoying the illuminated river scenes at night. Stopping at a few points of interest along the way, the next main stop was Wat Arun or ‘Temple of Dawn’ (which I had only seen from a distance until now). We stopped here and our guide explained the Stupa and architectural features of the temple. We admired the view from the riverside and our guide put a coin in a machine to release a bucket-load of yellow pellets. She threw a generous handful of pellets into the river and the water instantly boiled up with thousands of fish writhing around in an infernal frenzy; it was one of the most gruesome but fascinating things I have ever seen. Fishing is banned in the temple grounds and the regular presence of tourists with bucket-loads of pellets ensures that there are always plenty of fish in this part of the river. We cycled on, over a couple of the canals that we recognised from the Long Tail boat trip, towards the Santa Cruz Church and there was a service taking place. This Catholic Church had been built in 1770 during the reign of King Taksin and it shows the ongoing legacy of the Portuguese population who were apparently among the first Europeans to reach Siam (modern day Thailand). There was also a French Catholic Church nearby. We cycled through a village, riding through narrow passageways on plank pavements beside wooden, tightly-packed houses; we could see into many of them and even saw two bemused-looking snooker players. 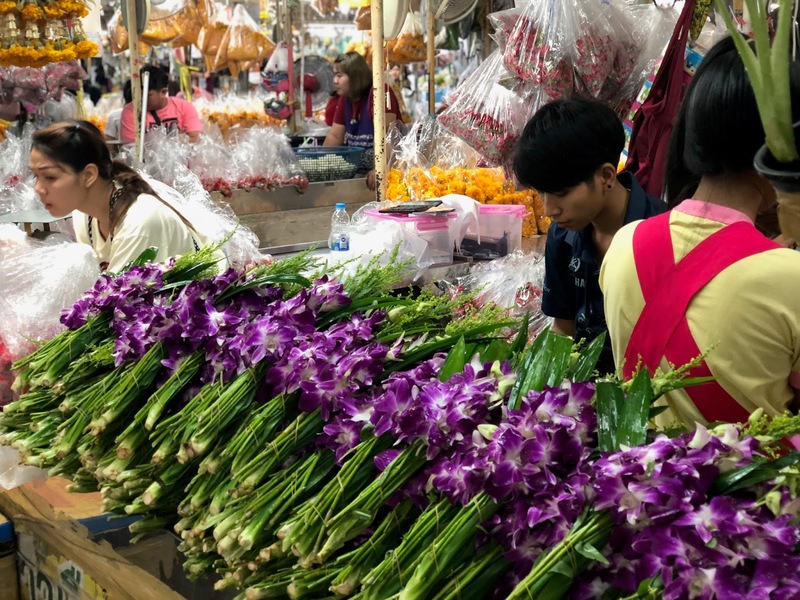 We continued over the Saphan Phut (Memorial Bridge) and circumnavigated the flower market, Pak Khlong, eventually entering it from the side closest to the river. It was just about to come to life, but it was still fairly quiet at this time. 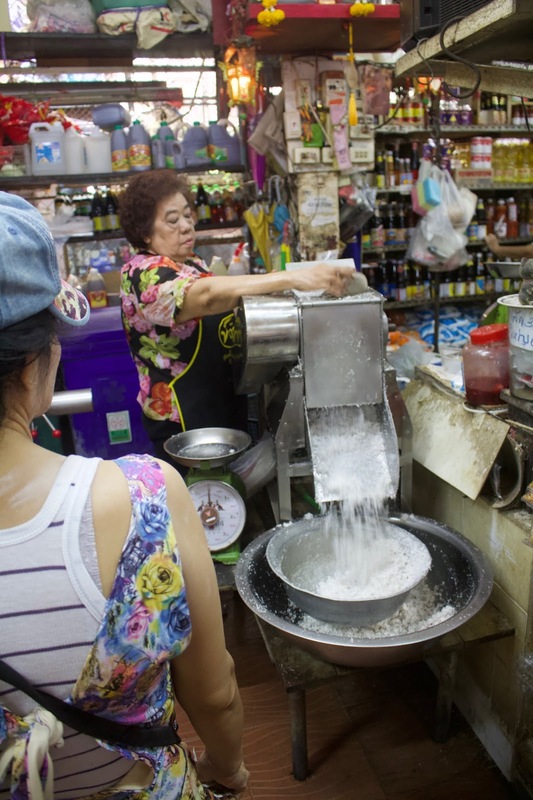 We cycled through the market and I envied a worker who was filling large bags with ice from a machine. As we cycled past we could feel the refreshing chill of the falling ice. We parked the bikes carefully on a street corner by a bridge and walked back towards the flower market. On the way our guide took us to, and bought us all something from, four or five street food stalls. The first stall sold corn on the cob, heated and salted. Another stall sold pork and sticky rice. The next sold a sort of puréed, starchy substance served inside a banana leaf. Iced teas and coffees were made from plenty of tins of condensed milk at the next stall. The last stall was the most colourful, with fruit of bright yellow, orange and red. The owner sliced an apple-like fruit as well as papaya and baby or ‘phulae’ pineapple. The latter was peeled and artfully slashed to create a screw-thread pattern (like so). We ate the fruit on its own first before the merchant produced some wooden skewers and mixed granules of chilli and brown sugar. This was undoubtedly the best fruit I’ve ever had and this way of eating it was very moreish, especially after a good cycle ride. I attempted to thank this purveyor of finest fruit and chilli-sugar by speaking in the Thai language. I had an exceptionally limited vocabulary and displayed an abysmal retention of the words I did try to learn. I managed to say the Thai greeting of ‘sà-wàt-dee’ (สวัสดี) and I also loved saying the very similar ’sabai-dee’ (สบาย ดี), which is a ubiquitous Thai phrase meaning to be in good health. I hastily searched a downloaded dictionary on the Google Translate app and attempted to use the word 'ขอบคุณ’ (phonetically kòp kun) meaning ‘thank you’. I listened to Google’s audio example on repeat but my bold attempt to say ‘thank you’to the stall holder was met with silence. Either I rendered a perfect ‘thank you’ in Thai that was worthy of no further refinement or comment (unlikely), or I uttered something so incomprehensible that he did not recognise any of the sounds as being from any language. I suspect it was the latter. Anyway… I tried. We entered the flower market, which was now busy with customers and traders - mostly women. They had laid out flowers on top of the ice from the bags that we had seen being filled earlier. As well as the people, the light, colours, patterns, symmetry, textures and stacks of flowers (not to mention the smells - especially things like jasmine) made this a photographic paradise. Our guide took us to a stall and gave us each a flower bud, the size and shape of an onion, attached to a thick stalk. We watched in amazement as the stall’s grand master skilfully folded each of the most external alternating petals of the bud into triangular thirds, back on itself, into a concave shape. The petals of these lotus flowers looked beautiful when she had finished and now it was our turn to arrange the bud in a similarly attractive way. Jumping back on the bikes we cycled a short distance (back towards Chef Andy’s place) to Wat Pho. 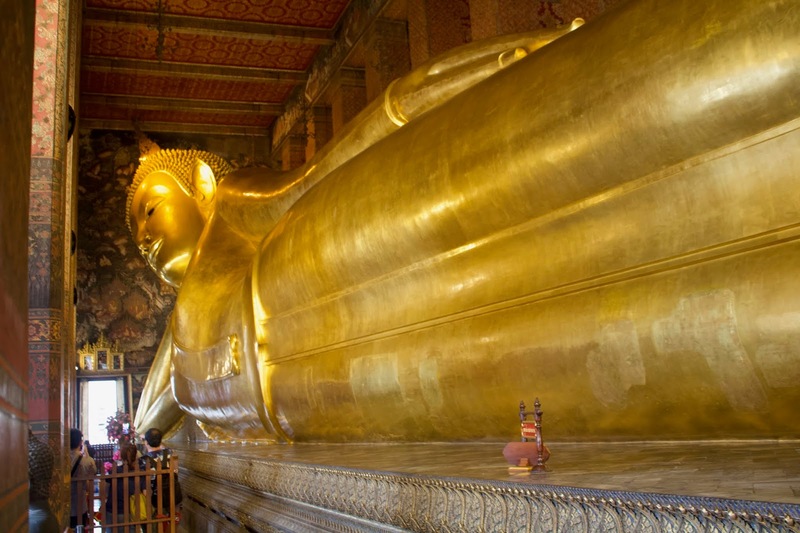 We had all visited briefly this morning to see the Temple of the Reclining Buddha. The temple buildings were now closed but the grounds were still open at night. Our guide explained the history and significance of the site, with 91 chedis (or stupas), and pointed out many interesting things: “These statues were brought here from China and given as a gift to the King. They were also used as ballast for the ship on the voyage.” Our guide took photos of our group and encouraged us to place our folded lotus flowers on the chedis, which we all did in silence and with great respect. I laid my lotus flower thinking of my late Nan. She loved photography and would have been in her element in the flower market, and elsewhere in this colourful and photogenic country. She would have been thrilled. We returned to the bicycle shop, cycling past the Royal Palace and many Government offices in the final 3km. The cycle trip had been exactly 17km and it was among the best excursions of the whole tour. After the tour, we walked down Khao San Road. This area is hailed as “the centre of the backpacking universe” and it features 410 metres of the worst aspects of tourism, in my opinion. None of us liked it; we didn’t want to dare each other to eat a scorpion or to go a bar playing deafening music so we got out of there very quickly. It was the antithesis of the peace and tranquility of the temples and quiet suburbs we had seen on the bike tour. I had a fairly leisurely day on Wednesday 24th October 2018. After all the excitement of the cooking course and the cycling trip the day before I was ready to have a relaxing day at the hotel. The outdoor pool on the fifth floor was warm and inviting and I spent the day alternating between reading, sleeping, eating, swimming and practising in preparation for our concert on Thursday. On one occasion I returned from the pool and went back to my room, which had just been beautifully made up by the cleaning staff. Cleaning was in progress in the adjacent room to mine and I was amazed that the cleaner had taken his or her shoes off, and left them outside the room while they cleaned it - they, like all the Thai people I met, were so polite and respectful. While we had been enjoying a few days off, several members of our group had been working with young people as part of the Start Your Impossible scheme on Monday 22nd October. 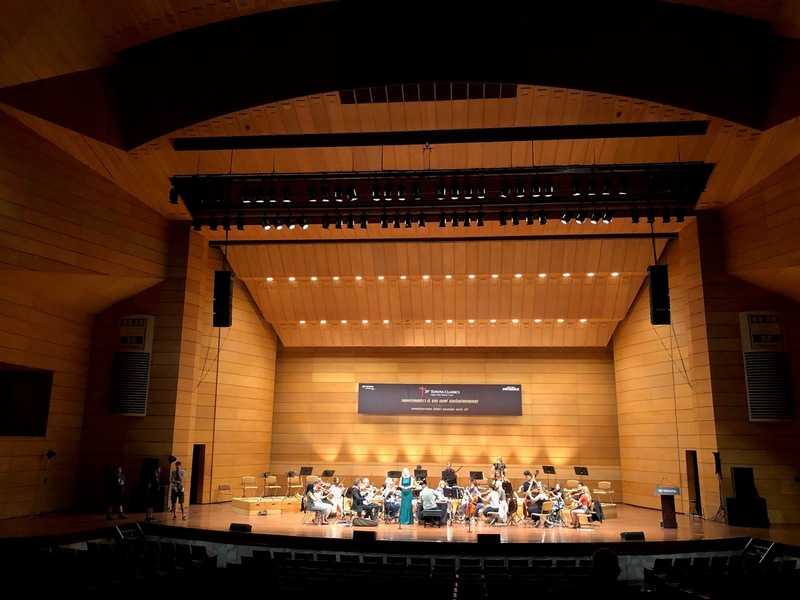 The director and string principals who had been involved in teaching these workshops were touched and inspired by the young people from the Immanuel School of Music in Bangkok. It was, by all accounts, an inspiring and moving day. Thursday came and we began rehearsing at the Thailand Cultural Centre, just a few blocks down the road from the hotel. The concert began with a recorded version of the National Anthem of Thailand. The Orchestra of the Age of Enlightenment and audience stood as the Royal guest (and an entourage) entered the highest tier of this 2000-seat auditorium. After playing the Water Music, I stayed to listen to the soprano soloist, Charlotte Beament, sing Handel’s Lascia ch’io pianga from Rinaldo. She was awesome. I enjoyed the rest of the concert from the wings. I particularly enjoyed listening to the four horns playing in Wolfgang Amadeus Mozart’s Symphony No.25 in G minor [K.183]. The natural horn parts are ingenious; two horns play crooked in B-flat and the other two horns play crooked in G. Brilliantly, this meant that Mozart could create minor chords by selecting notes from the two sets of harmonic series available. We left Bangkok from Suvarnabhumi (understanding much more about why it is called ‘Land of Gold’) airport on Friday 26th October 2018. I had absolutely loved Bangkok; it felt alive and uninhibited. I was aware that some people were now longing for a quieter pace of life - which we would get in Vientiane in Laos, our next destination on the tour.